Join us as we re-imagine the library at Albemarle High School in Charlottesville, Virginia. How have I been driving my family and friends crazy this summer? Taking picures! Almost everywhere I go, I see something and think, "Oh, we could use this in the library." I am constantly taking pictures and asking questions. At Barboursville Vineyard, I was struck by the ruins. The discovery aspect of them is facinating. I could picture kids wanting to climb and explore. Isn't that what the library is all about - a place to discover and explore? How can we bring some of the magic of the ruins into the library? At C'ville Coffee, I was struck by the sense of community. This coffee shop is a meeting place. A place where business people can work. Moms can connect while their kids play. Teachers can collaborate and be thrilled to eat something other than cafeteria food :) How do we bring this sense of community into the library? How do we let kids know that it is ok to meet with friends, socialize and work together (see pervious post about rules)? So, that was my summer. When I saw something cool, interesting, different, I snapped a picture. Here are some images that have guided my thoughts as we are striving to create a friendly, welcoming atmosphere, a coffeehouse eclectic place that is appealing to HS students, an exciting space for discovery, immagination and creation. . . Between now and August 21st, we are going to think about policies and procedures. As two new librarians, we're sure to have our own ideas - new ideas, different ideas. Some will be good and some will need adjustments and tweeking. I found these signs around the library, last year's RULES. How do you feel seeing these signs? What do they make you think? Are you welcome? Are you wanted? What will you do in this space? Is this somewhere you want to be? So, in thinking about this year, seeing those signs weighs on me. Our goal is that our entire school community feels welcome and wanted. We want everyone to see the library as a place they belong - to sit, to stand, to relax, to study, to research, to read, to communicate, to create. We need to develop policies and procedures that will encourage all of that (and things we haven't yet thought of!). It's also important to be concious of the way we are communicating the ideas. How can we phrase things in a positive way? A welcoming way. A way that says to the school community that the library is OUR space and everyone is welcome in it! Our superintendant, Dr. Moran, shared this You Tube video on Twitter. It was made by librarians and students at New Canaan High School. How do you feel seeing this video? What do they make you think? Are you welcome? Are you wanted? What will you do in this space? Is this somewhere you want to be? What policies and procedures are vital to respecting the needs of all library users? Using technology to enhance the curriculum or students' experience and connection with the curriculum has been a long standing interest for me. The year I started Library School was also the year I started using email, the World Wide Web and Yahoo (anyone remember Lycos? Ok, I googled it. It's still around. Who knew?). Throughout my career, those have always been options. But, now! When I think about all of the tools and resources that are available now, I don't think they are an option. They are the way to go. I was looking for something else and stumbled upon this YouTube video. It is a powerful project that shows massive amounts of knowledge, thought, reflection, creativity and maturity on the part of the student. If I had to explain the Civil Rights Movement, this would be part of my explanation. Without any words of her own, this student answers all the why, what, when, where and how questions. Would the 5 paragraph essay have been as effective as this? Have you noticed the shift to an increasingly self-service consumer experience? 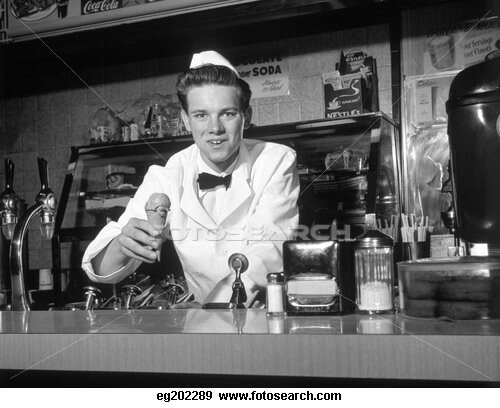 Think back to when my parents and grandparents were kids and there was a soda jerk who would prepare and serve your soda and ice cream treats. Then we move to my experience of self-serve machines. 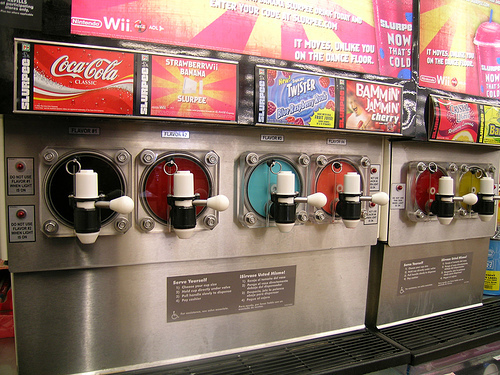 Soda, slurpies, coffee. You name it, you can get most things yourself. We are seeing this trend increase with self-checkout in the grocery store. Pump your own gas (anywhere but New Jersey, one of the best things about the Garden State!). Kiosks at Barnes and Noble to help you locate books. As I think about my children's experience as consumers, I wonder if they will consider service the way I do? Will they see the salesperson in a setting like the Nordstrom's show department as a help or creepy? I took my young daughter to Bloop for frozen yogurt one afternoon and snapped some pictures. The complete self-service nature of Bloop (and several other fro-yo places in town) had me thinking about how this shift should impact our work in school libraries. How should our model of customer service change? What practices and routines should we review? What changes need to be made to make our students comfortable? Thirtsy? Help yourself to a water and pay at the register! There is this large and beautiful space that I am beginning to make my home. As I think about shaking things up and moving things around, some might wonder what my inspiration is. This is an image taken from my former library at Meriwether Lewis Elementary School. Two students are sharing a comfy chair with their feet up doing some work on a laptop (much the way I am working right now). When Joan Ackroyd moved from an elementary school to Monticello High School, she spoke about the magic of the library in an elementary school and that she wanted to bring some of that magic to high school students. That statement resonated with me and I will strive to do the same for my students. I am sure it will look different but the idea is there. There are some new comfy seating options waiting to be unpacked and added to the library. Clunky (and very old) desktops are in the process of being replaced with laptops - an update that will allow us to relocate several tables to the CTE wing and provide opportunities for students to explore flexible options. Imagine what you could do with all this added space. We're hoping the kids will look at it and imagine too! On a Friday afternoon in April, I interviewed for the position of librarian at Albemarle High School. In the interview I was asked to describe my ideal library. The specific furniture, technology or books are not what comes to mind when I envision my ideal library. I think of the hum you'd hear when you enter, the work you'd see happening, students working together, students working with teachers, some students chatting, others reading and still others studying quietly. A space where the entire school community feels not only welcome but wanted. I was given the opportunity to tour the library on my own after the interview. I walked into a beautiful space. Windows that look out onto a courtyard where students congregate provide beautiful natural light. Exposed brick. Eclectic furniture that reminded me of Central Perk from Friends. I must have done ok in the interview because I was offered the position! There is so much potential. We have so many ideas. I have been working here and there over the summer to begin the process of creating that ideal library. It's a team effort, there are so many people throughout the school and division who re-imagine the library with me and we are working together to make it happen. I have a feeling that I am driving my co-workers, family and close friends crazy. I am transferring within ACPS from an elementary school to a high school. My time at Meriwether Lewis Elementary School exposed me to many new thoughts, ideas, technologies and people. It was a perfect place for me to grow and become ready for this next challenge. This blog will focus on the process of re-imagining the Albemarle High School library. We are going to re-imagine all aspects of the library from philosophy of service to physical space to the concept of a book to the daily nuts and bolts and beyond. I hope that you enjoy coming on this journey with me. Please comment, make suggestions, ask questions. I am so excited to start this journey!